Looking for beautiful, custom built patios? Then you have come to the right place. This gorgeous Huffman stone patio is eye catching, luxurious, and fully loaded. This unit has a brand new, stainless steel grill and fridge built right into a stone countertop. Perfect for family and friend gatherings, or for just cooking for your family in the relaxing atmosphere of the backyard. Also included in this Huffman stone patio is a beautiful, stone fireplace, as well as a shaded fire pit, perfect for cold winter nights. These luxurious features would be a great option for your custom built backyard patio! We always use only the highest quality materials for every single one of our outdoor luxury patios. 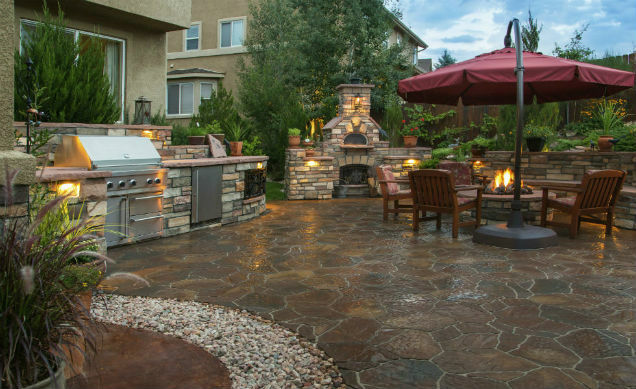 Houston Outdoor Kitchen Pros is looking forward to building you a luxurious backyard patio for the best price in Huffman! Call today at (832) 409-3542.